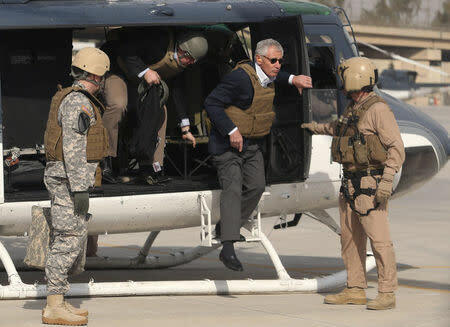 BAGHDAD (Reuters) - Iraq's Prime Minister Haider al-Abadi pressed outgoing U.S. Defense Secretary Chuck Hagel on Tuesday for more air strikes and weaponry to accelerate what he called the "descent" of Islamic State. The plea underscored tension in the U.S.-Iraqi relationship, with Baghdad pushing for more aggressive assistance than Washington has provided so far, four months after President Barack Obama launched air strikes against IS in Iraq. 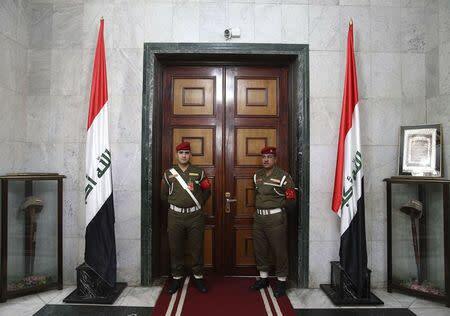 The militant group was "on the descent at the moment", Abadi told Hagel as the two met at the prime minister's offices in Baghdad's fortified Green Zone. "Our forces are very much advancing on the ground. But they need more air power and more ... heavy weaponry. We need that." Hagel, speaking to journalists afterwards, said he had held candid talks with Abadi and that delivery of some weapons had already been accelerated. Obama ordered U.S. troops out of Iraq in 2011 but sent some back this summer to help counter the advance of Islamic State, which has declared a 'caliphate' on territory it has captured in both Iraq and Syria. Last month Obama authorized roughly doubling the number of ground forces to 3,100 as the military expands the reach of its advisers and starts training the army and Kurdish forces. Iraqi forces had strengthened their positions around Baghdad and blocked Islamic State's move south, Hagel said. 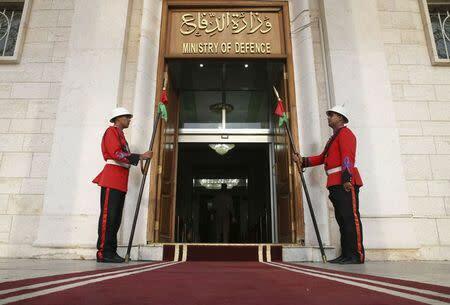 They "will be able to intensify offensive operations as the coalition's training effort expands into northern, western, and central Iraq," he added. Asked about the timing of any Iraqi assault on Mosul, the largest Iraqi city under Islamic State control, Hagel said the two countries were making preparations together but declined to give details. A U.S. defense official said Washington believed Iraqi forces were still several months away from trying to recapture Mosul and that it was not top of Baghdad's action plan. Iraqi Defence Minister Khaled al-Obeidi on Monday declined to give a timeline for an offensive in Mosul or other regions, say operations would depend on the situation on the ground. Since their June offensive, Islamic State's Sunni militants have had little success breaking beyond the solidly Sunni Muslim provinces of Anbar in the west and Salahuddin north of Baghdad, as well as the strongly Sunni province of Nineveh, which includes Mosul. Hagel suggested that success on the battlefield was only part of the answer. The key to progress was an inclusive government in Baghdad that could rally all Iraqis -- something he said Abadi was working towards. Since taking office in September, the Shi'ite prime minister has worked to build alliances with Sunni tribes, and reached a deal on oil exports with the semi-autonomous Kurdish region after months of dispute.